If we look at the motherboard, we see a few pros and a few cons. The board gives us 5 PCI and no AMR or CNR. This is fine with me. Of course, we have an AGP 4X slot, but no retention mechanism is provided. This is not a big deal unless you are a system builder that plans on implementing this board. 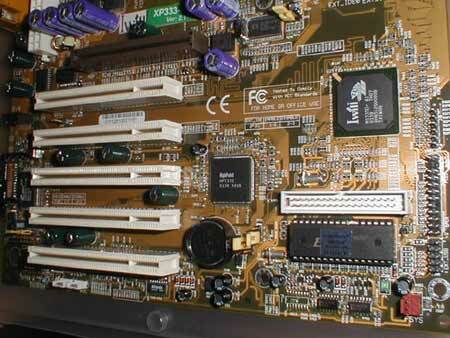 Of course, this is more of an enthusiast's board than an OEM's motherboard, so this is actually quite a moot point. There are also three DIMM slots, each capable of using a 1 GB DIMM. All four IDE controllers are nestled together right by the edge of the board, but the floppy controller is all of the way down by the BIOS chip. The CMOS battery as well as the clear CMOS jumper is located in the lower portion of the board where they are easily accessed. Speaking of jumpers; the RAID enable/disable jumper as well as the on board sound enable/disable jumpers are located in the lower half of the board as well. This makes them free from the obstruction of drive cables or the drives themselves. There are two jumpers located all of the way up and to the right of the board. These jumpers control the voltage to the DDR memory. Covering the ALi Magik 1 Northbridge chip is a very dookie green anodized fan very similar in appearance to Thermaltake's Blue Orb. The trained eye will notice that the XP333R has 3-phase voltage regulation. 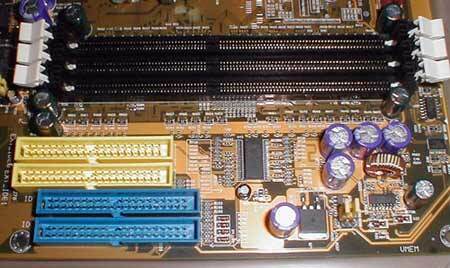 This allows the board the board to push up to 46A to the processor. 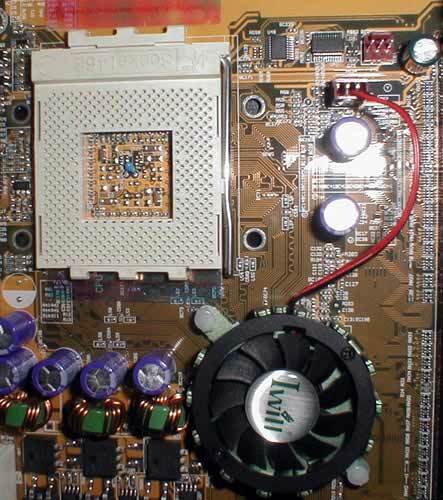 Other motherboards that cost more but are made considerably cheaper do not have 3-phase voltage regulation. These other companies don't count on the consumer noticing (*cough* Asus). Unfortunately, there are only two available fan headers: one for the CPU and one for a front mounted case fan.